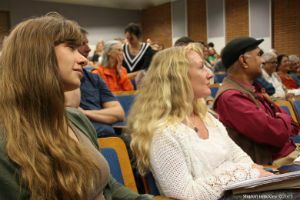 The round table, entitled “Thinking with the Yoga Sutra: Translation, Interpretation” was open to the public, and featured a wide range of topics. On the weekend of April 10th, 2015, Loyola Marymount University’s Dr. Christopher K. Chapple, along with the Master’s of the Arts in Yoga Studies program, hosted scholars from around the world to discuss their unique research into the Yoga Sutra. The presenters included the Himalayan Institute’s spiritual head and chairman, Pandit Rajmani Tigunait*; Rutgers University's Edwin Bryant; Dr. Christopher K. Chapple, Navin and Pratima Doshi Professor of Indic and Comparative Theology at Loyola Marymount; Oregon State University's Stuart Ray Sarbacker; University of Texas' Stephen Phillips; The University of Manitoba's Ian Whicher; Stony Brook University's Andrew Nicholson; and many more. 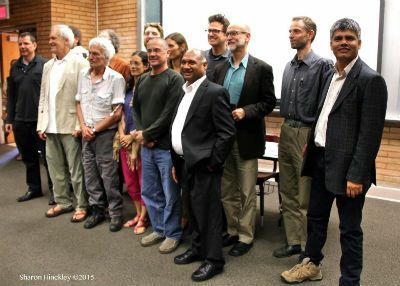 The round table, entitled “Thinking with the Yoga Sutra: Translation, Interpretation” was open to the public, and featured a wide range of topics, including (but not limited to) fresh insights into philosophical concepts, posture analyses, and history. Pandit Tigunait's presentation at the round table last weekend (entitled, “Meditation on Vishoka and Jyotishmati as a Doorway to Experiencing the Majority of the Practices Described in the Yoga Sutra”) took a practice-based approach, and also focused on texts central to tantra and hatha yoga, such as the Saundaryalahari, Sri Vidyarnava, Hatha Yoga Pradipika, and select Upanishads. Chapple's presentation (entitled, “The Path to Origins: Pratiprasava”) explored the physiological and psychological aspects of self-mastery prompted by an inward journey. Bryant's presentation (“Ishvara in Patanjali’s Yoga Sutra”) traced the origins of Ishvara past the Yoga Sutra, into late and post-Vedic eras. Sarbacker's presentation (“Why Yoga Philosophy Matters: Reflections on the Past and Present of the Ashtanga Yoga System”) discussed the import of Patanjali's system throughout India and beyond. Nicholson's presentation (“Patanjali in the Eyes of His Opponents”) focused on first and early second-millennium Indian thinkers who argued against Patanjali's system. As practitioners who revere the Yoga Sutra as fundamental to our own spiritual growth, we here at YI can only imagine how remarkable it must have been to participate in this ground-breaking event. The bridging of minds and sharing of knowledge that occurs as the world of academia meets the world of yoga is certainly inspiring. Let's hope for more of the same! *Explore Pandit Rajmani Tigunait's work by visiting the Yoga Sutra Master course series.